How was your Valentine's Day? I couldn't have asked for a better night in with Devin and a couple bottles of champagne! It was a nice surprise when I got a text from Devin yesterday morning that he wasn't going to have to work last night, so I decided to plan a little surprise for him on my way from work. He works at least twelve hours every day and comes home so exhausted. He definitely needed some love and pampering! 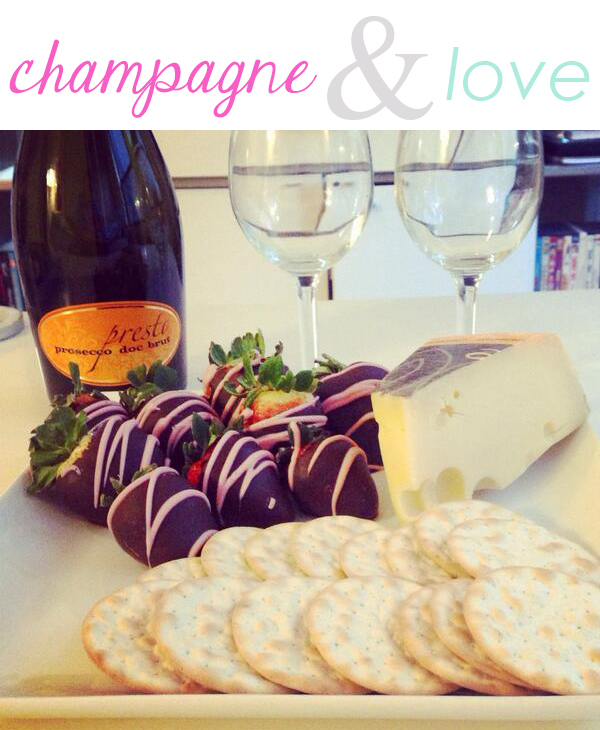 I stopped at Whole Foods and picked up some strawberries, chocolate, champagne, cheese, and crackers. Oh, and a gourmet salted caramel chocolate cupcake (his favorite). I had this set up when we walked through the door and he was happily surprised. We spent the night talking about our day and catching up on some Olympic action. Overall, I'd say it was a very successful Valentine's Day. I've never felt so much love! I hope y'all had a great night as well! Sounds like a great time! Happy late Valentine's Day! D'aww, such a cute little date idea. Love it!